In a perfect world, athletes would compete without fatigue. They’d always be fresh, hence fully capable of displaying their vast abilities. Unfortunately, as we all know, the world is far from perfect. No one is immune to fatigue. Thus, knowing that fatigue is inevitable, it makes sense to train certain qualities in its presence. Hand-eye coordination is a prime example. If you compete in a sport that relies on this attribute, it is imperative that you maintain your ability when fatigued. For instance, if you are a boxer, it’s not enough to display hand-eye coordination in the early rounds. You’ll need this critical skill in the late rounds as well. If you’re familiar with this site, you know that I’m a huge proponent of jump rope training. The rope isn’t just an excellent conditioning tool, it also enhances pertinent qualities such as agility, coordination, and quickness. The mind is also constantly engaged with each turn of the rope. Even a split second lapse in concentration can cause you to trip. Therefore, the rope doesn’t just challenge the body, it also challenges the mind. 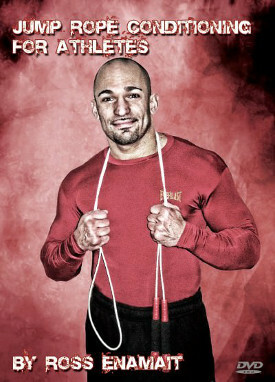 Considering the physical and mental benefits of the jump rope, it makes an ideal addition to your hand-eye training. I enjoy integrating the jump rope along with a hand-eye coordination activity. The rope serves as the conditioning tool, while hand-eye coordination is targeted during your rest periods. For instance, you will skip rope (conditioning) for a timed round and then juggle (hand-eye) during your rest period. Thus, when you are juggling, you’ll also be trying to recover from the rope work that you just finished. In other words, you will never be fresh when juggling. A brief demonstration can be seen below. 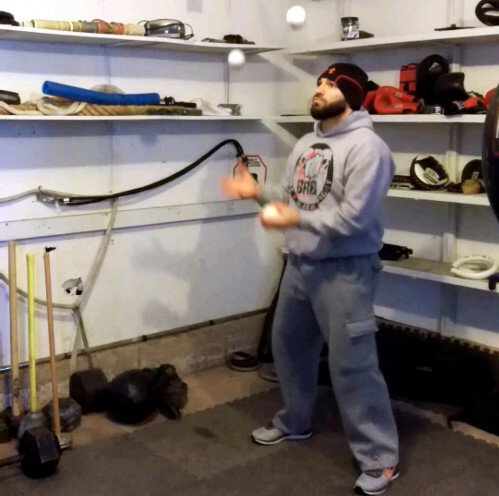 The rope interval is performed first, followed by juggling. As for sample routines, a hand-eye coordination activity can be added to almost any rope workout. For example, if you perform 30 to 60 second sprints with the rope, you could juggle for the 30 to 60 seconds that you rest in between intervals. The same could be done if you were skipping for longer rounds (ex. 3 to 5 minutes). During each rest period, grab a few balls and do your best to juggle until the next bell rings. As demonstrated recently, juggling isn’t the only hand-eye coordination activity that you can perform. There are countless options. Juggling certainly is convenient however. You can juggle almost anywhere. Yet, despite the benefits and convenience of juggling, I wouldn’t limit yourself to a single activity. When training hand-eye coordination, I’m a firm believer in variety. The goal isn’t to specialize in a single drill. Instead, you should strive to challenge yourself with a varied approach. Therefore, it goes without saying that you don’t need to be a juggling expert to benefit from juggling. It is acceptable and expected that you will struggle. That is by design. If it was easy to perform the activity in a fatigued state, the benefits would be limited. The goal of performing a hand-eye coordination activity in a fatigued state is to challenge the body and mind. You are essentially forcing yourself to be ultra-concentrated. Such acuity is often necessary during competition. We are trying to replicate that heightened sense of awareness in the gym. Fortunately, we can do so without risk. The worst thing that can happen is you’ll get frustrated by dropping a ball. As I’ve said before, the significance of hand-eye coordination cannot be overstated. It is a critical attribute for so many athletes. Any time spent training the hands, eyes, and brain is time well spent. And please note, I don’t say this to suggest that you should add hand-eye training to every conditioning workout. Such work is certainly beneficial however. You’ll be surprised at how difficult it is to maintain your ability while simultaneously dealing with fatigue. Mixing the jump rope in with some dedicated hand-eye coordination drills makes for an excellent combination that you’ll never outgrow. after a long workout. Now he has great hand-eye coordination. I like that you preach hand-eye coordination (not enough people realize how important this is!). Lucky for me I was taught to juggle in gym class at my elementary school and I still love it to this day!